Excessive travelling for work has meant little blogging of late. The coalition’s cutting of the highest level of income tax has not failed to catch my eye though. The main arguments for these type of tax cuts always seem to be that we are unfairly penalising the wealthy, that we are making the UK a terrible place for the rich who will all leave and (even more bizzarely) that tax cuts on rich people will mean higher tax revenues overall. 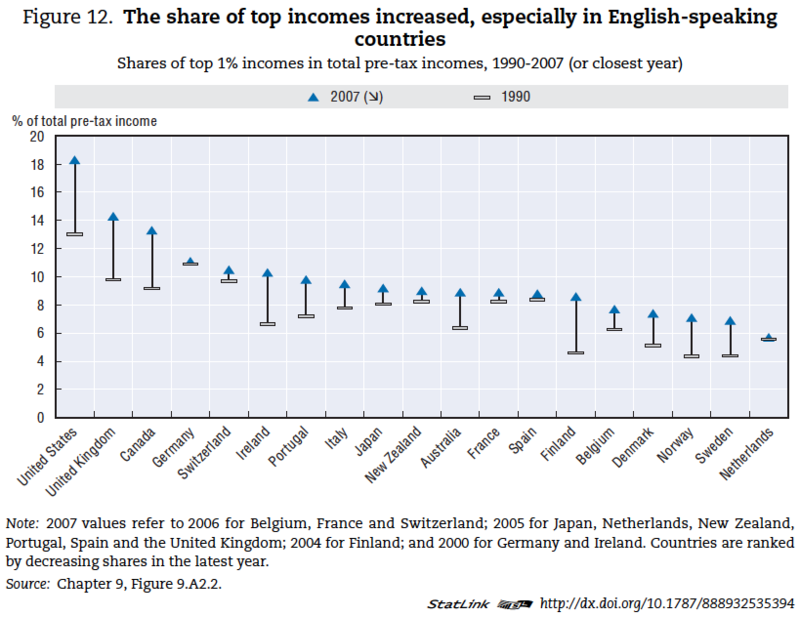 The OECD recently published a report on income inequality. You can read the whole thing here but this is a graph from the report showing how the share of the income received by the richest 1% has changed between 1990 and 2007 (data for the UK is to 2005, see footnote). So, of the countries featured, the UK has the second highest level of inequality between the top 1% and the bottom 99% after the US and has seen that measure of inequality rise from 9.8% of total income in 1990 to 14.3% in 2005. The income of the rich has been diverging from the income of everyone else for a long time and cutting their income tax is not really a brilliant idea in these circumstances. The Osborne fans will tell me it will boost the economy and help sort out the economic mess they inherited from the last government. I’ll respond pre-emptively – the current economic problems were really not caused by the rich not being rich enough. If you want to believe that tax cuts for the rich is a good thing then fine, we’ll agree to disagree but can you honestly look at the graph and say that the richest 1% have been getting a raw deal or that the UK is a bad place for rich people? If you answered “Yes” to those two questions then you probably also think we are all in this together.